1. Preheat the oven to 200°C, gas mark 6. Cut a 1cm slice off the top of the tomatoes. Using a spoon, scoop out the fl esh and seeds – don’t break the skin. Put the flesh and seeds in the small bowl of a food processor with the garlic; blitz until smooth. Put the tomatoes cut-side down on a piece of kitchen paper to drain. 2. Cut the bread into 2cm cubes and put in a bowl. Pour on the puréed tomatoes and toss. Remove the bread (don’t worry if it hasn’t soaked up all the liquid) toss with the oil and spread out on a baking tray; season. Bake for 25 minutes, turning once, until crisp. 3. Turn the oven to 180°C, gas mark 4. 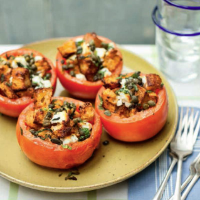 Toss the bread with the mint, capers and cheese; pack into the tomatoes and bake for 15 minutes. Serve at once with a drizzle of extra virgin olive oil and a green salad, if liked.